I remember my dad buying candy a few weeks before Halloween every year when I was growing up to give out to trick-or-treaters. He got the good stuff too, like Reese’s Peanut Butter Cups, M&M’s, Kit Kats, Twix, and Snickers. Never the Dum Dum Pops, Sugar Babies, or Necco Wafers. And every year, he’d have to go buy it all over again the day or so before Halloween because we’d have eaten it all up before then. None of us really minded, and we didn’t have that many trick-or-treaters. I grew up on a cul-de-sac that not many people ever came down unless they knew someone on the street. My dad would count the trick-or-treaters every year, and the most I remember him counting was 23. So, in other words, that first batch of candy was really for us, he only pretended that it wasn’t. That was just my dad. Fast forward a few decades into my current life. I don’t eat candy anymore, and I try to limit how much sugar my son eats (although he has been exploring more lately). I may not have had a candy bar in over eight years, but that doesn’t mean I want bags and bags full of them, tempting me. 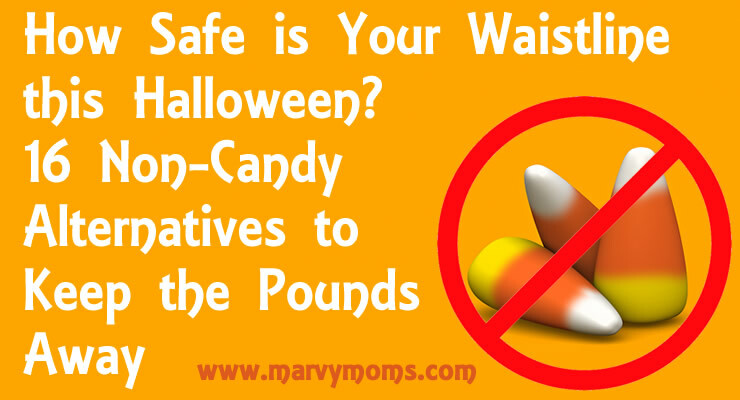 Last year I wrote about Managing Candy Overload the day after Halloween. The first thing I mention is “Don’t give out candy at your house so that you won’t have leftovers on top of candy your kids bring home (remember this for next year).” Well, I’m reminding you before Halloween so that you can get a head start this time. We get anywhere from 100-150 trick-or-treaters at our house every year. This will be our fourth Halloween in this neighborhood. In the past I’ve given out jelly bracelets, spider rings, skull rings, pretzels, cheese balls, and pumpkin erasers. I typically bag everything up so it’s easy to grab one for each kid that comes to the door. One year I bundled them up inside a sturdy white napkin, tied it with string, and drew black eyes on it so that they looked like ghosts. Each year I’ve found a few of the things lying on the ground in our front yard, or in other people’s yards when we go out trick-or-treating. I’m guessing these are the older kids that just want candy, but still, I think I can do better this year. I’ve bought most of my non-candy treats at Target or the Dollar Tree because I’ve waited until the last minute. I end up spending way more than I want to and get things that I really don’t want to give out. I’ve considered ordering from Oriental Trading Company, but never want to pay or wait for the shipping. This year, I decided to search “Novelty Toys” on Amazon to see what I could find. Aside from some adult novelty items that I was sort of expecting to see with that search, I did find some unique and fun items to give out for Halloween. You may have already noticed that I like to save money, so I’m sticking to items that have Prime 2-day shipping (that makes shipping free and quick). I also searched for items that have large quantities. 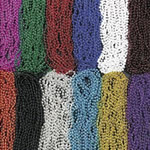 A good word to use in your search for this is “gross” to get items that are sold in lots of a dozen dozen (144 items). This may not be as important to you if you don’t have the volume of kids knocking on your door that we do. I’ve put together a list for you of some of my favorite non-candy treats that I found. 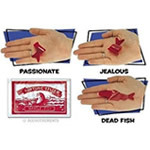 $7.99 144 Fortune Teller Miracle Fish – Fortune Telling Fish: These were one of my favorite things to buy as a kid. I’m so glad that as cheesy as they are, that they still make them so my kid can love them too. 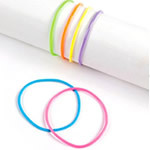 $4.65 Neon Jelly Bracelets (144 pcs): I was one the first kid in fourth grade to wear jelly bracelets to school after visiting my cousins in Ohio. Soon after that, everyone had these as well as jelly shoes. Thanks to Madonna for this fashion trend that’s still alive today! $6.99 144 Vinyl Glitter Flower Jelly Bracelets: We never had anything this fancy when I was a kid. 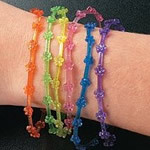 They were simple jelly bracelets that you wore from your wrist to your elbow. 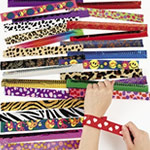 $12.25 50 assorted slap bracelets- mega pack! : I don’t know what it is, but I get a definite sense of satisfaction every time I slap one of these bracelets on my wrist. Please tell me I’m not the only one that feels this way! Anyone? $7.77 144 (1 Gross) ~ Halloween Jumping Spiders ~ Plastic ~ Approx. 2″: I was originally going to post jumping frogs, but then I found these. Perfect for Halloween! 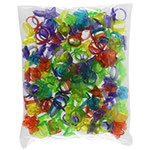 $5.49 Rhode Island Novelty 144 Plastic Glitter Rings (Assorted Colors and Designs): Something different than your average spider ring. Who doesn’t love glitter? 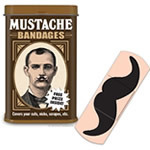 Accoutrements Mustache Bandages: These are hilarious! What an easy way to join the mustache craze than a bandaid! I’d be a little concerned putting this above the lips though of a little kid though as it might irritate if it covers their lips at all. Reviews said that they don’t stick very well though, so maybe not a problem. Still, a lot of fun. For $1 and it includes a tin (my son loves tins and small boxes) and 15 bandaids (I’ll be giving out one to each kid), it’s worth it. UPDATE: I received these today and they are plenty sticky. Also, they are larger than they look on the tin. They are by no means kid-sized and are wider than the standard bandaid. I trimmed it down after trying it on by cutting along the outline of the mustache. It comes with several mustache designs and a bonus temporary tattoo. $9.87 8″ LumiStick Brand Glowsticks Glow Stick Bracelets Mixed Colors (Tube of 100): Glow bracelets help kids to be safe as they wander the dark streets on Halloween. 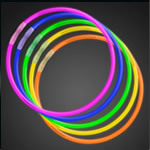 For $59.99 you can get 1000 8″ Lumistick Glow Light Stick Bracelets — Wholesale Pack (10 Tubes of 100) instead to save some money and have enough for a few years. 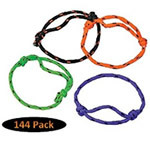 $7.95 12 Dozen (144) Halloween Friendship Rope Bracelets: Just another bracelet, did I mention how much kids love bracelets? 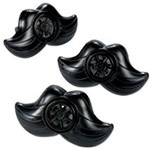 $8.70 Mustache Lip Whistles Kid’s Novelty Party Favors (48 Whistles): Okay, these are probably the coolest thing on this list. I’m definitely getting these this year. It’s a mustache! It’s a whistle! It’s a mustache whistle! I love these! 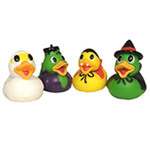 $6.99 Dozen Assorted Halloween Costume Mini Rubber Ducks Ducky – 2.5″: Here come the ducks! We have a rubber ducky collection here, so of course I had to include a few different types. Not something I’ll buy 150, but still fun to have. 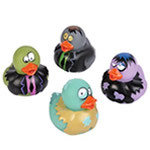 $5.98 Dozen Vinyl Assorted Zombie Design Rubber Ducky Duckies Toy – 2″: For your Plants vs. Zombies fans! Zombie ducks! 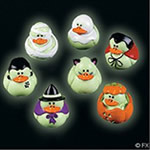 $11.83 Two Dozen (24) Mini Glow-in-the-dark Halloween Rubber Ducks Duckie Ducky: Just in case you didn’t have enough ducks already, here are some monstrous duckies that glow int he dark. 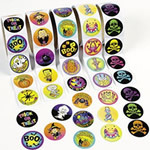 $12.95 500 Halloween Stickers: Obligatory stickers. Enough said. 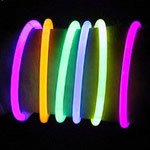 $18.95 50 22″ Premium Glow Stick Necklaces Assorted Colors: This is perfect if you only have a few trick-or-treaters. They gave these out at the town pumpkin walk last week and it was great for lighting the way when everyone was carrying one. You could give them out unlit, but I think it’s fun to get them glowing before giving them away. *NOTE: Prices listed are current at the time of this post, but may change at anytime. 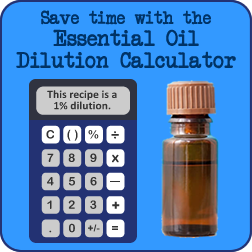 Some products may also not be available depending on inventory. At least a couple of the items listed here are add-on items, which means that you have to buy at least $25 in Amazon merchandise before they can be shipped (this helps Amazon offer certain products at ultra-low prices). So, there is hope! You may not be able to stop other people from giving your kids candy, but at least you won’t have the further burden of eating all of the candy before Halloween and eating it up afterward. That’s got to save you at least a couple of pounds! I ended up getting 10 tins of the mustache bandages, two sets of mustache lip whistles and one set of fortune telling fish, for a grand total of $31.97. What are you giving away this year?